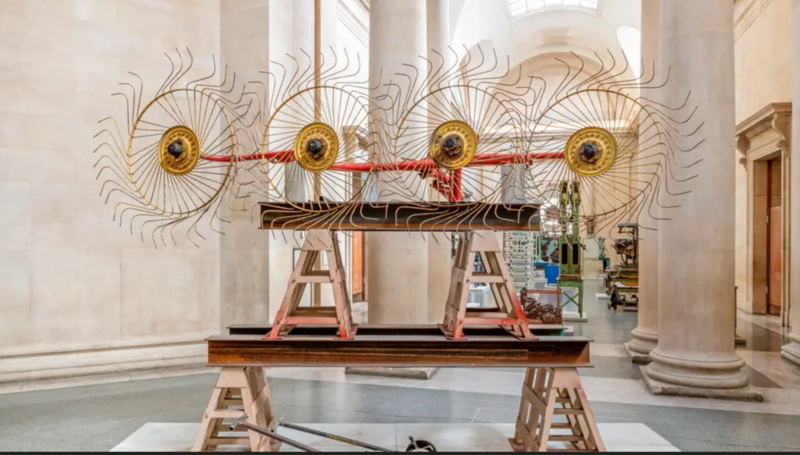 Mike Nelson (University of Reading 1986-90) has transformed the grand spaces of the Duveen Galleries into something between a sculpture court and an asset strippers’ warehouse. He has carefully selected objects from the post-war Britain that framed his childhood – including enormous knitting machines, woodwork stripped from a former army barracks, graffitied steel awnings and doors from an NHS hospital. Their manipulation and arrangement subtly shift them from what they once were into sculpture, and then back again to what they are – examples of the machines and equipment left over from industry and infrastructure. The exhibition weaves this allusion with that of British history. It presents us with a vision of artefacts cannibalised from the last days of the industrial era in place of the treasures of empire that would normally adorn such halls. The annual Tate Britain Commission invites artists to create a new artwork in response to the grand space of the Duveen Galleries. Artists who have previously undertaken commissions in the Duveens at Tate Britain include Anthea Hamilton, Cerith Wyn Evans and Pablo Bronstein.